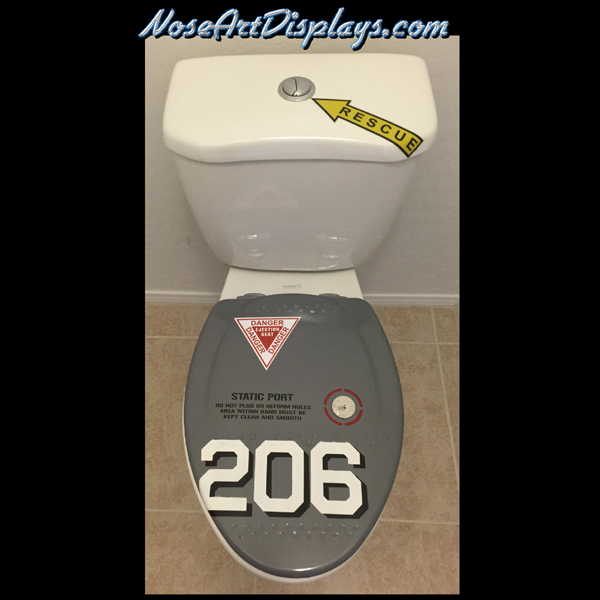 Military Aircraft inspired Toilet Seat, fashioned from a wood toilet seat, with the addition of 88 flush aluminum aircraft rivets, three digit ‘Nose Number’ of your choice, DANGER EJECTION SEAT sticker, actual Static Port altered to be flush rivet mounted to the seat and painted the military color of your choice. Of course with all of my products, YOUR ideas are more than welcome, I want to build you a toilet seat that any Aviator would be proud to take a Number Two! Most toilet seats are either ROUND or more typically lately, ELONGATED like this sample seat. I will custom make your seat from a brand new wood toilet seat. Stock, it will have that ‘small twist’ to remove the seat feature found on modern toilet seats. (Yes, this means your spouse can remove and replace this seat in a few seconds and hide it from you, that’s YOUR problem, not mine. I’m not getting involved with that.) Add actual cost for the silent closing models. Basically any seat that you would find at Orchard Supply Hardware or Home Depot, just give me the model number, the Nose Number desired and any special features that you like. You may notice that I painted the 202 on crooked on this one as well as the STATIC PORT. I will make sure yours are painted on straight. I promise. This particular seat has a matt clear coating on the top to simulate a modern Jet Aircraft paint job, and a semi-gloss clear paint on the actual seat for comfort. Perfect gift for your Retired Military Pilot, or anyone who wishes they were one, like myself. Be sure to see my other items, along the same general idea, but mostly hand fabricated and one of a kind products made from aluminum. These take up to a week for me to make, as I have to allow paint drying time four times for Gray, Black, White and then Clear for the Nose Numbers so be patient.